Tantalum pentoxide, Ta2O5, is a high-index, low-absorption material usable for coatings in the near-UV (350 nm) to IR (>8 μm) regions. Dense, hard layers can be deposited by electron-beam evaporation or by sputtering. Typical applications include near-UV to near-IR antireflection and multilayer filter coatings. Tantala can be used in combination with low-index Silicon dioxide layers to form high index-contrast multilayer structures ranging from wide-band AR coatings to bandpass filters and dichroic beam-splitters. That material combination is used to make thick multi-layer stacks that exhibit very low stress. 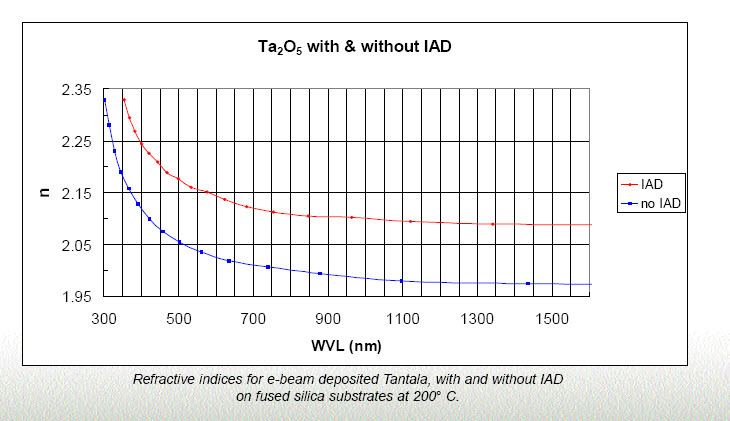 An advantage over Titanium dioxide layers is the absence of absorption above 900 nm, making Tantala a superior material for near-IR laser and bandpass coatings such as Nd:YAG laser and telecom applications. Hard, scratch-resistant and adherent coatings can be deposited on glass and metal substrates. Films are also used for dielectrics in film capacitors and as gate insulators in large scale integrated circuits requiring low leakage voltage characteristics. Completely oxidized tantala films are absorption-free over the range below 400 nm to at least 8 μm. Evaporation causes some amount of oxygen loss and requires a partial pressure of oxygen during reactive deposition. Residual absorption can be eliminated by baking the films in air at 300 -400° C for 4 hours. Alternatively, the use of IAD during deposition results in absorptionfree layers at lower substrate temperatures. Adhesion is excellent to glass and to most other oxide compounds. The films generally grow with a micro-crystalline /near-amorphous microstructure whose scale is reduced on hot substrates and with IAD. Under some evaporation conditions, such as low energy resistance-heated evaporation, low substrate temperature, or excessive background pressure, the films grow with low packing density and can exhibit index changes when vented to moist air. Deposition by sputtering, ion assist (IAD), or at very high substrate temperatures, improves the packing density and eliminates spectral shifting due to moist air-vacuum cycling, producing very stable layers. Layers are hard, scratch resistant, and insoluble in boiling water and most acids (except HF). Refractive indices are dependent on the degree of oxidation and the film density achieved. The refractive index value responds to high energy deposition techniques and to substrate temperature because both parameters decrease the void volume by increasing the packing density of the microstructure. IAD increases the refractive index and discourages crystalline growth, thus producing higher packing density. Post-deposition baking in air for 2 hrs at 400° C can be used to increase the refractive index of depositions done without IAD, and simultaneously reduce absorption due to incomplete oxidation by nearly 10 times. Typical index values are plotted below for films deposited with- and without-IAD. The addition of IAD increases the index by~0.12. The starting material is supplied as either tablets, sintered pieces, or pre-formed melted shapes such as cones for e-beam pockets. Recommended preconditioning of tablets and pieces consists of slowly sweeping the low-power electron beam to uniformly fuse the surfaces of the material and avoid hole drilling by the beam. Monitor the pressure and melt surface to minimize outgassing and spitting while slowly increasing the power to just below evaporation temperature. The crater left after a deposition can be refilled with tablets or pieces and remelted to form a fresh flat evaporation surface. Targets of Tantalum metal are available for reactive sputter deposition. Substrate temperature 175° C to300° C.
Ta2O5 is available in both sintered and pre-melted form, in shapes such as cones, rods or pieces. If your required form is not listed, please contact Materion for more information. Materion offers materials for evaporation as well as sputtering targets. Materion manufactures a complete line of vacuum deposition materials for optical coating applications including powders, pellets, pieces, tablets, rods, cones, crucibles, evaporation discs, pre-melted evaporants.